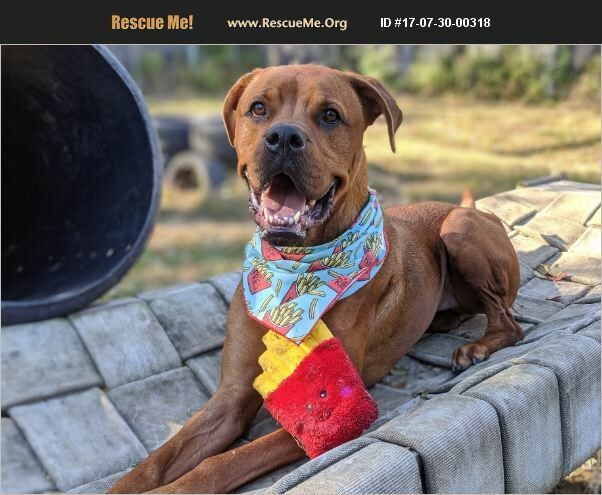 Here at Adopt-A-Dog, Fry serves the role of class goofball very well.�%A0Effusive in both his love for his friends and in every experience he has, Fry is one of a kind. He takes to new experiences, such as learning how to play soccer or football, or going for a ride in the Adopt-A-Dog van, with an enthusiasm that cannot be matched. He truly is a unique dog and has most of his human friends saying 'Oh, Fry!' or 'That's Fry for you' whenever he does something just a bit more awkward than his counterparts. A big guy, Fry came to our shelter when his original family could not handle his size. At the time, he had not reached a year old so he still had both growing and learning to do. We began working with Fry on basic obedience and his manners when it came to both people and other dogs. The Fry we have today has come a long way from the Fry we first met, and we know he is ready to show off for his very own family. When making new friends, Fry typically needs a bit more time to get comfortable and get to know someone. Once he has spent some time with you, and has been feed a copious amount of treats, Fry will be your best bud.�%A0 �%A0All this big guy needs in a home is a willingness to get slobbered on followed by tons of comfortable places to sleep and stretch out. We know that this not-so-small Fry is ready for his new family.